Tom rang muoi – salt and pepper shrimp is a favorite dish of ours that my mom used to make whenever she saw large whole shrimps on sale. Even though mom is an awesome cook and knows all her recipes by heart, she still enjoys to watching TV cooking shows, particularly Chef Uyen Thy of the cooking show “Bep Nha Ta Nau” on SBTN, a southern California Vietnamese TV station. She also has a restaurant called Uyen Thy Bistro in Little Saigon that we enjoy. Uyen Thy is really charming to watch and the show is well produced with many practical Vietnamese recipes including tom rang muoi. But unfortunately for most, it’s entirely in Vietnamese. We enjoy watching it to brush up on our Vietnamese and learn recipes! We modified her recipe of tom rang muoi adding some sichuan peppercorns as well. Wash shrimp in cold water and cut off long whiskers and sharp point on the head with scissors and dab dry with paper towel. In small bowl, combine salt, pepper, and sugar and set aside. If you’re using the sichuan pepper corns, lightly toast and then using mortar and pestle, crush coarsely and add to seasoning mixture. Heat large wok or deepfryer with cooking oil to high, about 350 degrees. Dredge the shrimp in the corn starch to get a light coating, shaking off excess. Deep fry the shrimps in small batches until nicely pink/red and crispy, about 3-4 minutes. Remove and drain. Heat another large wok/pan with a bit of cooking oil. When oil is hot, add garlic and then onions, jalapenos, and scallions. Quickly stir-fry the veggies for a minute or so and add the shrimp and sprinkle about 1/2-1 ts seasoning mixture. Continue to stir fry and make sure seasoning coats well, for another minute. Transfer to serving plate and serve immediately. Sprinkle on additional seasoning according to taste. Some people add the seasoning to the cornstarch mix, but we find this doesn’t coat well because the cornstarch and seasoning have different densities and do not adhere to the shrimp evenly. If you don’t want to deep fry the shrimp, skip that step and stir fry the shrimp. Serve with rice or as appetizers. A great salty, spicy, and crunchy dish! Our favorite part is the head! I'm salivating. I'm definitely getting some shrimp at the grocery store tomorrow. Your blog always makes me hungry, gotta stop visiting your blog late at night lol. I love the texture of the crispy shell. Gotta eat this dish with a ton of steamed jasmine rice. The shell are packed with calcium, a good bonus too! Check my caramelized shrimp, it's a great finger food for my buffet-style dinner parties. 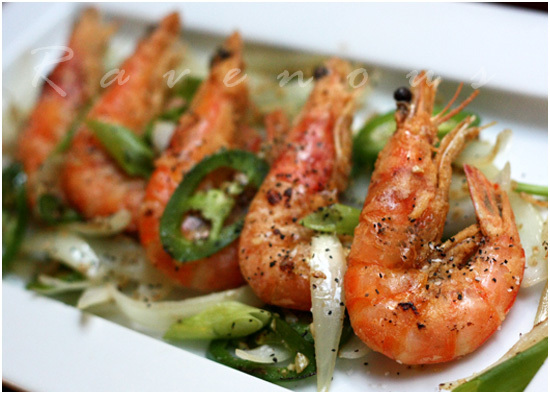 I am a big fan of shrimps and i'm always lookinf for creative recipes to cook them. I think I have just found one! I think my husband may beg me to make these (he won't have to beg). They look and sound SO good. I love the combo of textures and flavors. this is one of my hubby's most favorite dishes. in fact, we just had a big serving in seattle last week and was craving for more last night. your version looks like perfection!! 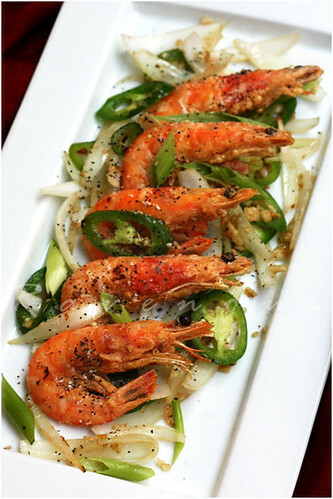 mathildescuisine: salt pepper shrimp is really a quick way to enjoy it..let us know how it goes! connie: tom rang muoi does have great texture, let us know how it goes for you! Τhanks so much for taking the time to visit my blog. It is a pleasure to discover yours and I look forward to exploring and visiting. OMG, those shrimps look amazing and making me hungry. That first picture is really stunning. It just makes me want to rip right into that crunchy head. hahaha The Chinese version of this dish is almost exactly the same and I love the delicious simplicity of it. Ivy: Thanks for stopping by! 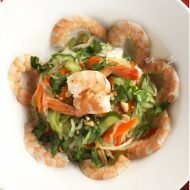 We hope your enjoy our blog full of vietnamese recipes and more! Jessica: the head in tom rang muoi is our favorite too! Yum, these are beautiful and sound absolutely delicious! I love salt & pepper shrimp…but yours look way better than any I've ever tried. And I've never tried the head…I must! These are gorgeous shrimps! I would love the delicious crunchy texture! thank you so much for visiting my blog, and lead me to yours. Lovely dish, and look amazingly delicious! girlichef: Thanks for the compliments and visiting our blog! 5 star foodie: the crunch of the salt and pepper shrimp is one of our favorite reasons to eat this. show and chatter: Thanks, we hope you stop by often! elra: thanks for stopping by our blog! Wow! That looks amazing! 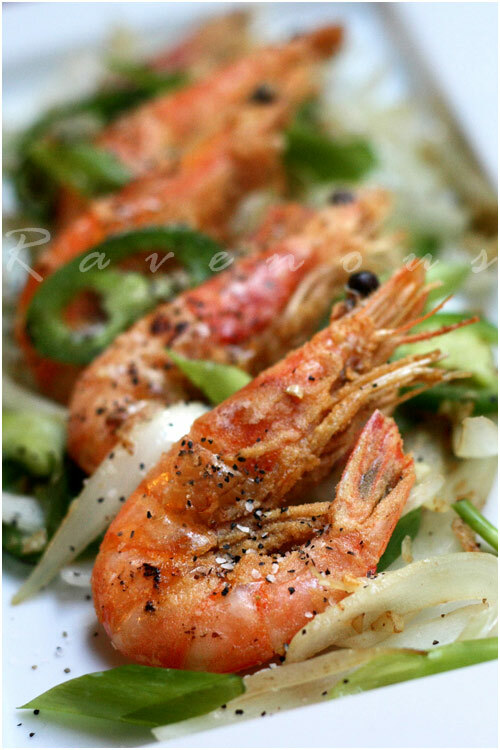 Your photography skills are STELLAR and though I've never been a prawn fan…you've made a believer out of me! Now I really want to grab me one of those! This looks really good! I recently got some Himalayan sea salt and organic peppercorns from Sustainable Sourcing https://secure.sustainablesourcing.com and I think I'll use them in this recipe tonight. Thanks for sharing! my mom loves uyen thy too! where do you guys watch her videos? So glad i hopped over here!! I was just trying to figure out what to do w/some spot prawns I bought!! this looks incredible!!!! Wow, this salt & pepper shrimp definitely looks fabulously good! Phuc, your photos and cooking look awesome! One item which I haven't seen covered on any recipe site on the net is Boiling Crab's shrimp w/ the whole shebang seasoning. If you're up for the challenge and can come up w/ 'Shrimp w/ Ravenous couple seasoning"….my jaws would drop…haha. Wow! This looks like an amazing dish…excellent photos. 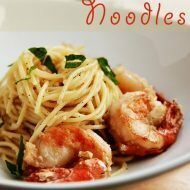 I love this dish, but never thought to look up recipes before. I'm looking forward to trying this out and btw, great pictures. Gorgeous photos! Shrimp is a staple at our home and I am definitely going to give this a try! carolyn: thank you so much for visiting our site..yours is fab! sophia: we wished we could share our tom rang muoi, but it's quick and easy recipe to try at home! anderbuf: exotic sea salts would be a great way to try salt pepper shrimp. thanks for letting us know. papierteresa: we catch her on youtube! jen: thanks for visiting! let us know how how salt pepper shrimp works for you. comradechu: let us know know how salt and pepper shrimp recipe goes for you. katherine: thanks and let us know how tom rang muoi recipe works for you. fearless kitchen: thanks for stopping by our blog. salt and pepper shrimp recipe is really as simple as it sounds. This look so yummy! My mom used to make this all the time. I miss her cooking so much. I will definitely try this soon. LaLa: Tom rang muoi is really easy to put together…let us know how it goes! I am always looking for new recipes for prawns. This looks delicious and so well presented. Must try!! ellie: tom rang muoi is very quick to prepare..and the juicier/fresher the prawns, the better! I love your recipes and photos. I use photos from my computer as my screen saver, when I try to save any of your photos it just says OK and DOESNOT allow me to save the picture. Am I doing something wrong or is it that you donot allow your pictures to be used. Help!! I just made this for me and my dad, using this recipe. He loved it and so did I. Tom rang muoi has always been a favorite of mine at the restaurants in the bay area, including Bo Luc Lac. This tasted very much as in the restaurant, and I used honey instead of sugar and sea salt instead of regular salt for a bit more a healthy meal. Thank you very much for showing me the yummy way and bring this wonderful TRM onto my table. Thy: Thank you so much for the feedback–it's comments like yours that really make this blog and sharing recipes enjoyable! Do keep in touch and comment more often! I discovered your blog yesterday and decided to try out some of your recipes today. I made Tom Rang Muoi, Ga Kho, and Ca Chua Nhoi Thit. Since my boyfriend does not eat pork, I substituted ground beef for ground pork. I also added diced white onions, A LOT of black pepper, and bean thread noodles to the ground beef mixture. Needless to say, everything was a hit. Even my picky mother, who never thinks anyone's cooking is as good as hers, complimented me on the Ca Chua Nhoi Thit. Thank you! Xuan: Thank you so much for the feedback on our recipes!! Wish we could have been there for dinner! Take some photos next time and we'll post them! Evelyn: So glad the recipe went well for you!!! Shrimp is something you don't want to overcook for sure! Thank you for this delicous recepie. 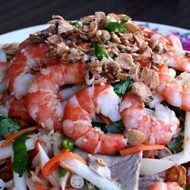 My husband and I love to go to this vietnames restaurant about an hour away from our home. That is where we first tried these shrimp and also he had avacado smoothies. I tired your recipie for the salt ans pepper shrimp and they were delicious. The only thing I need to do differently is buy bigger shrimp, cut more of the veggies and use a bigger pan. Other than that the shrimp was delicious and the avacado smoothes were great! Thank you!!! Gloria: So glad you and your husband enjoyed this! Using bigger shrimp will definitely make this a more impressive dish. Made this yesterday. It was so good and easy (though, i didn’t use all of the salt/pepper/sugar mixture). Thanks a bunch!!!! Well, I think I must be the lone dissenter here. We made this recipe this evening, and it was pretty bad – too much sugar, too much salt, too much pepper: so much seasoning that we really couldn’t enjoy the delicate fresher flavours of scallions, garlic or shrimp. Oh well; lovely blog otherwise, guys, and I’ll be back to try your other recipes, for sure. Your recipes look really good! Thank you for posting them and their pictures. I know nothing about cooking and eating shrimp, so how does one eat these tom rang muoi, please? Would it ruin the dish if the shrimp have been beheaded by the grocer before being placed on sale?